At this writing (October 17th) we have been notified one local 340 family lost their home as well as everything in it, when the October fires swept thru their neighborhood in Clearlake. Brother Pat Sandoval, his wife Kristina and their 4 children (ages 8 thru 15) are all safe and very grateful for the support and prayers they have received. I talked to Brother Sandoval in mid-October to see what we could do for him and he informed me that he had returned to work and was staying with family in Stockton until they can make a decision for their future. Brother Sandoval’s employer, Whittington Electric has established a GoFundME account to help them get through this very difficult time. If you wish to donate, log on to www.gofundme.com/fjtaj3-sandoval-family. Many IBEW Brothers and Sisters in Northern California were hit by this disaster and our prayers go out to all of them. Thank you to everyone who showed up with donations the day after the fires started. All of these donations have been distributed to the fire victims and we are no longer accepting donations at this time. This fundraising event held on Saturday October 14th was very successful and a whole lot of fun for Local 340 members and their families. Congratulations to Brother Iggy Rodriguez for taking 1st place in this year’s competition. Veterans Day, an official Public Holiday falls on Saturday November 11th . Therefore, per our CBA, we will observe this holiday on Friday November 10th. The Business Offices and Trust Offices will be closed that Friday in order to honor all Military Personnel who have served in the U.S. Armed Forces. Anyone interested in helping at one of these projects should contact Brother Greg Larkins at 916-208-4734. Let’s give back to those who gave so much! 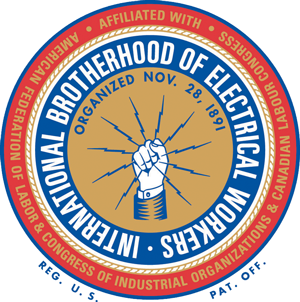 On behalf of the Officers and members of Local 340, thanks to all IBEW Veterans. 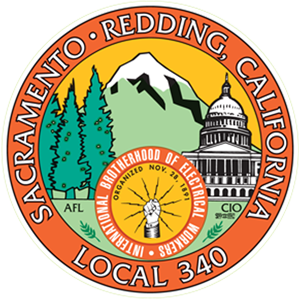 Effective with January 2017 dues, monthly membership basic dues for all Local 340 members will be increased by $1.00. If you are on automatic credit union dues checkoff, you will see the increase on your 1st receipt for 2017. We have notified all employers who send in dues for our members of this increase as well. If you are a member who self-pays your dues, be sure to increase your monthly payment by this amount. Also, if you haven’t done so yet, you might want to take advantage of paying online via our website. Just log on to www.ibewlocal340.org, enter your username and password and click on “Dues” in the top left hand corner. Once you enter your credit card information, you will receive a receipt that can be printed out and the actual IBEW Official Receipt will be generated and mailed to you the very next day. Please remember to supply a copy of your current state certification to the Business Office for scanning into your records. It saves the office a lot of time if we have a copy and the information on it allows us to send out the monthly reminders prior to the expiration date. Don’t miss the chance to win $1,500 cash, a shotgun or 150 Lottery Scratchers. All you have to do is buy a $1.00 ticket or maybe a book of tickets for $10.00. These can be purchased at the Business Office, at any of our Local events/meetings or from Local Officers and Members. The drawing will be held at the Membership / Christmas Dinner Meeting on December 6th. We are again going to “bulk up” the Christmas Baskets that will be given to our members in need. Donations of food and toys are appreciated. Please bring them into the Hall before December 8th and thank you as always for your generosity. The pin presentation is scheduled for Saturday November 4th here at the Hall. Anyone wishing to show support for this years’ members who will be receiving their 50 plus years of service pins and certifications, is welcome to attend this luncheon. Just call Reyna at the Hall to RSVP. Global Winter Wonderland is returning to Cal Expo this year with lights, entertainment, ice skating, carnival rides, international cuisine and holiday shopping. This event begins on November 11th and runs all through the Holidays. We have arranged with the event to offer discounts to Local 340 members but tickets must be purchased online and in advance. Just log on to www.globalwonderland.com/public/sacramento/index.cfm and enter the Promo Code of IBEW340. UNION APPRECIATION DAY WITH THE KINGS – March 25, 2018! I mentioned this in my letter to all of you in September, but it’s worth mentioning again! There are still tickets left for the Sacramento Kings vs Boston Celtics game in March. There will be a celebration of all Union Labor Trades at this game. If interested in attending, act now. Tickets can be purchased online @ www.sacramentolabor.org/news-actions-events or by calling Teresa Villasenor @ 916-927-9772. Please note that this offer is open to all members and there are a limited supply of the discounted lower level seating tickets available. We are hoping Local 340 has a great showing of members at this game. I am sorry to report the passing of one of our former Local 340 members. Tim Brown was the son-in-law of Retired Brother Tom Fox, and a very good friend and mentor to many. May he rest in peace. Wishing all of you a very Happy Thanksgiving Holiday. Health & Welfare Open Enrollment runs from November 1, 2017 thru December 15, 2017. If you wish to make changes to your current medical plan please call Teresa Raney in the Trust Fund Office @ 916-923-0666 now. Remember, the deadline for open enrollment is Friday December 15th. CIVIL SERVICE UNIT MEETING – Quarterly on the 3RD Thursdays of January, April, July & October at the Hall. NEXT QUARTERLY CIVIL SERVICE MEETING Thursday January 18, 2018 @ 5:00PM!